During the Sea TURTLE interview process, a big question was whether we could work as a team and how we would support one another if one of us struggled with a particular task. Tonight we put this to the test with an activity that involved us being enclosed in an area while blindfolded. Before we started Jenna told us the rules including not going over or under the barrier. This activity helped teach us the importance of teamwork so that if you dive in an area where the visibility is not great you know that you can always rely on your buddy and they can always rely on you to work together for safety and just to have fun. Tonight we also discussed what kind of habitats we would be seeing, like mangroves. Mangroves are important because they act as a barrier from waves and also create a community for plants and animals both on land and in the water. Mangrove roots photographed during last year's SeaTURTLE expedition. Check out this post for more details and read these posts from the Aquarium's Explorers Blog about mangroves. There are three distinct species of mangroves in Bimini: red, black and white. Red mangroves are closest to the water and their roots act as a nursery for lots of young animals like sharks. Black mangroves are found further up and get rid of salt through their leaves. White mangroves are located above the high tide line. We also learned about some of the animals we would see in the Bahamas, like jellies and coral. Most people know that these animals sting because of their tentacles, but how they do it is really interesting. Corals and jellies tentacles have stinging cells called nematocysts. Imagine a tiny, spring-like mechanism that is coiled up almost like a firing pin and when released in penetrates your skin and causes an almost burning feeling. Learn more about sea jellies in these posts from the Aquarium's Galleries Blog. 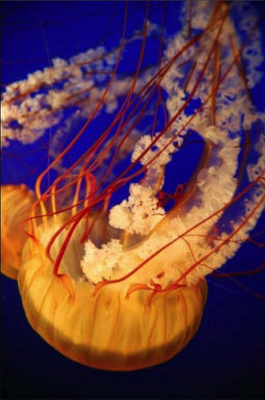 Since jellies and coral don’t have brains like us, their stinging cells have special nerves that allow them to sting independently. And they don’t just sting any time they touch something. They have a special trigger that helps sting food but not each other! I can’t wait to see corals, jellies and mangroves first hand!